This summer I’ve read up on the Swedish rules of the road. All in pursuit of obtaining my Swedish driver’s licence. I’ve mentioned this before, but I’ll go ahead and mention it again, with an American driver’s licence one is allowed to drive in Sweden for one year. 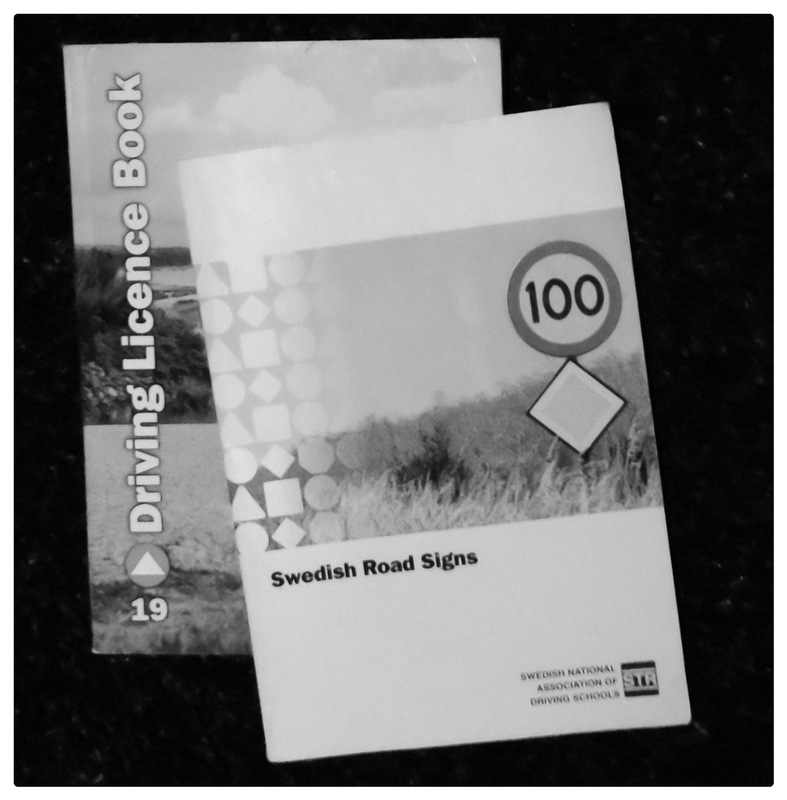 After which one must obtain a Swedish driver’s licence. One goes about this by completing two lecture sessions, reading two books, taking the written exam and then taking the driver’s test. If one has planned well in advance, one takes these tests as the year of allowed driving on an American licence is ending. I was not quite so organized. I did take the two lecture sessions, Risk 1 and Risk 2, last summer. Risk 1 is in a class room where you learn (in Swedish) not to drink and drive. Or do drugs and drive. Or be super tired and drive. Risk 2 begins by watching a movie about driving in different conditions and the importance of safety belts. Then you sit in a car rigged to some sort of farm machinery I’m guessing, and you get to go upside down in a car. I did that once in a real car. It was much slower and more relaxed this second time around. Then you go out and drive on a course, where portions of the course are made slippery with water and oil. Then they bring out the moose (some rubber tubing hanging on an L-shaped pole) and you get to steer around the moose while driving on water and oil. That’s why when this summer rolled around it was high time for me to get going on taking the written and practical examinations. In late May I passed my written, and mid June I passed my practical. So, yes, ladies and gentlemen, check off number six on my 30 before 30 list, because I have my Swedish driver’s licence! I am very excited about finally getting my Swedish driver’s licence. Although for some reason the day of felt a little anti-climactic. Not sure why. Getting the physical licence in the mail was certainly something to celebrate. But maybe the fact that I have been driving for about 10 years now takes away from the celebration a little bit. Maybe I just haven’t celebrated right…DRINKS ALL AROUND! Categories: 30 before 30, Books, Humor, Life | Tags: 30 before 30, book, book of the month, books, BOTM, celebrate, drinks all around, drive, driver's education, driver's licence, driving, körkort, read, reading, Sverige, Sweden | Permalink.